Cruising train Izu Creile offers you very comfortable train experience to Izu peninsula from Odawara. Posted on January 18, 2017 Categories Rapid service, Cruising train, Seasonal trains, Yokohama, Kamakura, Yokosuka, Odawara, Atami, Ito, Shimoda, Mishima, ShuzenjiTags Atami, Creile, Ito, Izu, Odawara, Shimoda7 Comments on Cruising train Izu Creile offers you very comfortable train experience to Izu peninsula from Odawara. Izu Creile runs along very scenic shoreline in Izu peninsula. Izu Creile was introduced in summer 2016. It runs between Odawara and Izukyu-Shimoda via Atami, Ito, other major spots in Izu peninsula as seasonal cruising train. It has very nice interior and you can enjoy very scenic view of shoreline from the large panoramic window. I have received many photos of this train from my reader, James. Now I can write about this train with many beautiful pictures from James. Thank you very much for your support, James! Continue reading Cruising train Izu Creile offers you very comfortable train experience to Izu peninsula from Odawara. Tokaido and Sanyo Shinkansen (Bullet Train), Most popular train to Kyoto, Osaka, Hiroshima and Hakata from Tokyo. Posted on May 27, 2014 August 8, 2015 Categories Tokaido, Sanyo and Kyushu, Tokyo, Yokohama, Kamakura, Yokosuka, Odawara, Kofu, Otsuki, Kawaguchiko, Gotemba, Shizuoka, Tokyo, Nagoya, Toyohashi, Atami, Ito, Shimoda, Mishima, Shuzenji, Osaka, Shin-Osaka, Namba, Tennoji, Kyoto, Nara, Kobe, Himeji, Maibara, Ogaki, Hiroshima, Miyajima, OkayamaTags Bullet Train, Hikari, Hikari Rail Star, Kodama, Kyoto, Mizuho, Nozomi, Osaka, Sakura, Shinkansen, Super Express, Tokyo, Travel information486 Comments on Tokaido and Sanyo Shinkansen (Bullet Train), Most popular train to Kyoto, Osaka, Hiroshima and Hakata from Tokyo. Shinkansen is the high speed train service in Japan. It is known as Bullet Train too. Tokaido Shinkansen is the oldest and busiest Shinkasen line and it is operated between Tokyo, Nagoya, Kyoto and Osaka. Sanyo Shinkansen is operated between Osaka, Okayama, Hiroshima and Hakata (Fukuoka). Both lines are connected each other. Many trains, “Nozomi” that is the fastest train on Tokaido-Sanyo Shinkansen, run from Tokyo to Hiroshima and some of those run to even Hakata. Most of Hikari run between Tokyo and Shin-Osaka, But some of those run to Okayama and Hiroshima. Sanyo Shinkansen connected to Kyushu Shinkansen at Hakata. Many trains, Mizuho and Sakura are operated between Shin-Osaka and KUmamoto or Kagoshima-Chuo directly. Please see the post, Kyushu Shinkansen to get details. 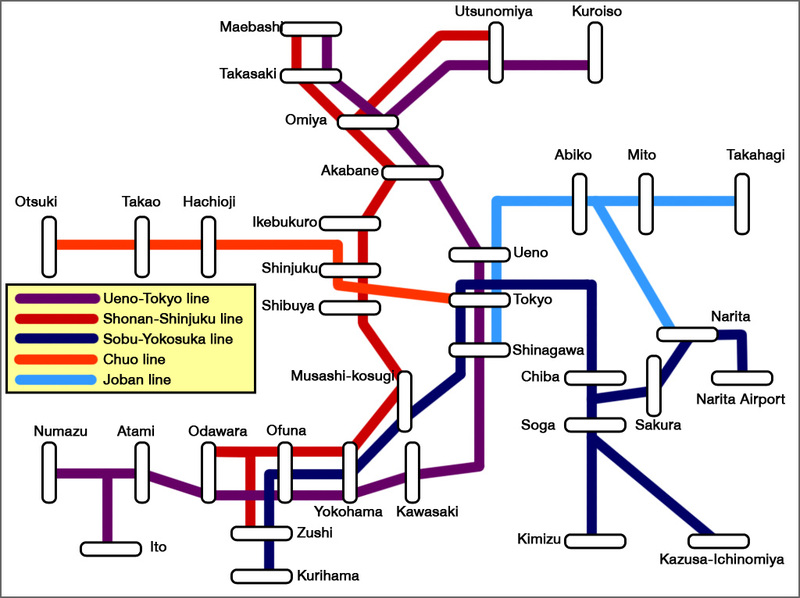 Many of you will use this train system between Osaka/Kyoto and Tokyo. In this post, I would like to share the information of this train system with you. Continue reading Tokaido and Sanyo Shinkansen (Bullet Train), Most popular train to Kyoto, Osaka, Hiroshima and Hakata from Tokyo. Rapid trains on Tokaido line have Shonan (green and orange) colors. Ivory and blue are Yokosuka-Sobu train’s color. Narita Express may be your first train in Japan. It is operated between Narita airport and Greater Tokyo area, such as Tokyo, Shinagawa, Shinjuku, Ikebukuro and Shibuya. And also service is extended to Yokohama, Totsuka, Ofuna and Omiya. This train stops both Terminal 1 and Terminal 2 in Narita airport.